CINCINNATI -- Not everyone's favorite topic is themselves, but a unique Walnut Hills gallery still wants you to sit down and chat about your life over a cup of coffee. Starting June 1, one of the five empty storefronts of Walnut Hills’ newly renovated Trevarren Flats will host the Street Stories gallery dedicated to building community and creating a snapshot of the neighborhood at this moment in history. The story gallery will stay open 11 a.m. to 8 p.m. Tuesday through Saturday for neighborhood residents to grab free coffee, watch video stories told by Walnut Hills residents, peruse a historical timeline of the community and record their own five-minute story from their lives. 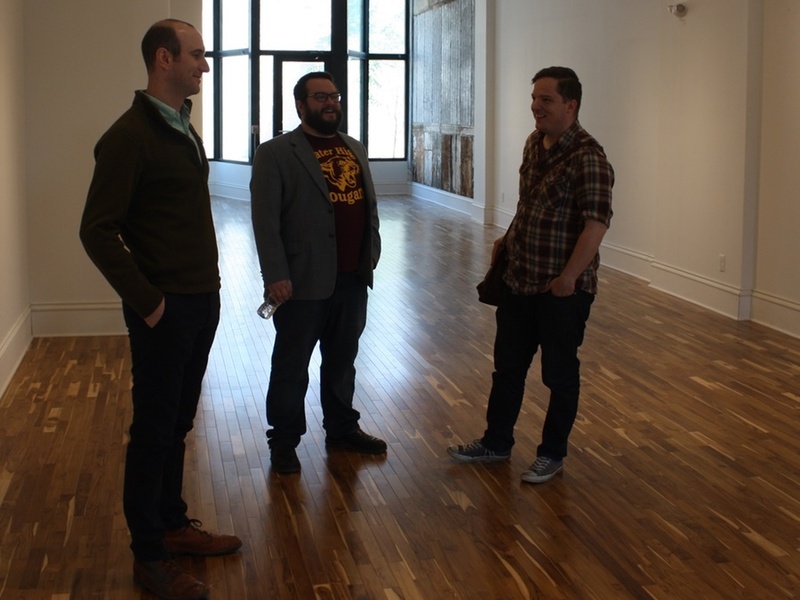 Cincy Stories Executive Director Shawn Braley (right) and Creative Director Chris Ashwell (center) talk logistics with Matt Reckman of Model Group. Ashwell admitted that free storytelling isn’t “the easiest product to sell,” so that’s why he and Cincy Stories Executive Director Shawn Braley are organizing community events with live music, kid-focused activities and free food and refreshments every Friday and Saturday in June, starting with the grand opening party from 6 to 10 p.m. June 10. Drawing inspiration from radio projects like StoryCorps and The Moth Radio Hour , Braley and Ashwell will collect the stories from their story booth and transform them into articles, videos or photo essays. This content will be published on a new multimedia website in late July called Street Stories, where they hope to eventually feature at least 20 stories from each of Cincinnati’s 52 neighborhoods. Other neighborhoods have already expressed interest in hosting the Street Stories gallery once it wraps up its project in Walnut Hills. One of the biggest challenges cities face is how to balance growth with retaining their culture and diversity, said Kevin Wright, WHRF’s executive director. "The challenge we have every day is, ‘How do we grow the neighborhood, for the neighborhood, but not displace the neighborhood?’” Wright said. Wright said development agencies like WHRF must provide neighborhood residents with the opportunity to tell their stories and voice their opinion on what change should look like in their community. Another goal of the Street Stories gallery will be a “demystifying” factor that shows how much more there is to Walnut Hills than the crime so often featured on television news. Ashwell grew up in suburban Mason and said his parents were dumbfounded at his choice to live in Walnut Hills. Wright is an example of someone moved by the power storytelling holds in creating a sense of place and a shared identity. An interactive New York Magazine article about the inhabitants of a Brooklyn street in the midst of gentrification made him want to move there, and he hopes the Cincy Stories project will have the same effect. “(I hope) people want to move to Walnut Hills for the right reasons. They want to move here because they like what the community is like now, not what it could become,” Wright said. For now, Cincy Stories is taking it month by month to see how long they’ll be allowed to stay in the Trevarren Flats location, which is owned by Model Group. 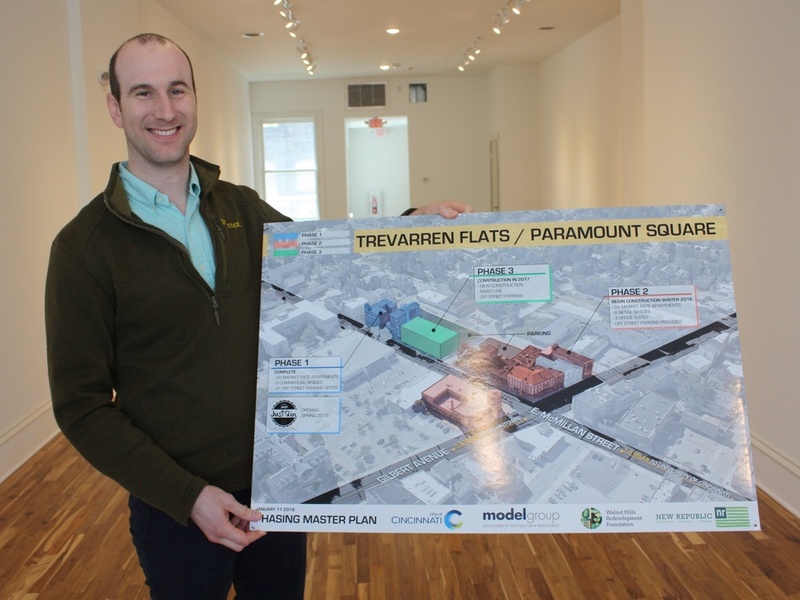 Matt Reckman of Model Group shows off building plans for the Peebles' Corner area of Walnut Hills (corner of Gilbert Avenue and East McMillan Street). Matt Reckman, assistant director of property management for Model Group , said barbecue joint Just Q’in is set to open soon, and Model Group is fielding letters of intent from potential retail tenants for the building’s four other storefronts. The Cincy Stories gallery won’t be there long before it’s displaced by a permanent store, so take your family and head over to 961 E. McMillan St. in June to add your voices to this multimedia time capsule.